Most summer gardens are in full swing by early July; the plants are growing like crazy and the harvest is finally coming in. The days are wonderful….and hot. While summer vegetable crops do love heat, there is only so much they can take. Understanding how heat affects you and your crops will make gardening in the heat more productive. What are Heat Zones, and How do they Affect Your Summer Gardens? Most gardeners are very familiar with cold hardiness gardening zones; however, not many are familiar with heat zones. Heat zones were established by the American Horticultural Society to easily describe how many heat days an area has. A heat day is defined as any day the high temperature reaches 86°F or higher. 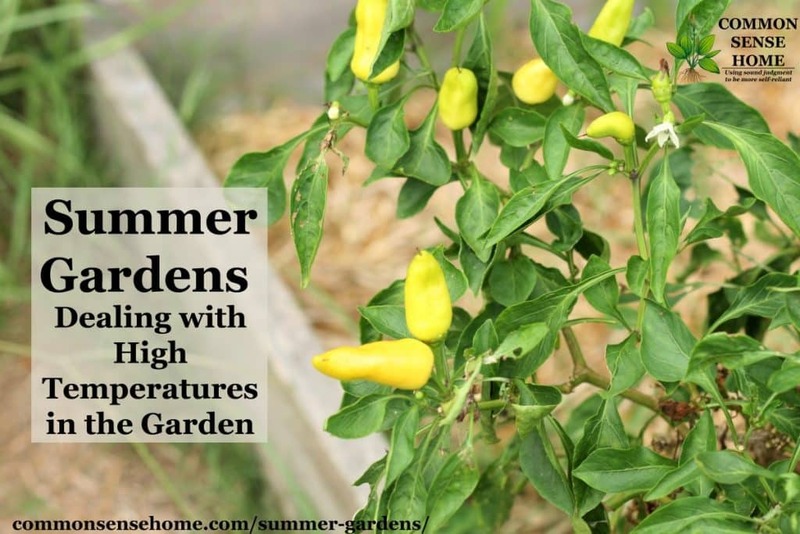 Knowing your heat zone and the average number of days you can expect to have temperatures over 86°F will help you decide how to manage heat in your summer garden. If you live in a heat zone 5 and you only have about 30 heat days a year, you will deal with that differently than someone who lives in a heat zone 9 and gets 150 heat days a year. What heat zone are you in and how many heat days can you expect? Check out the AHS Plant Heat Zone Map here. If you live outside the US, you can look at archives from your weather service and count the number of days your area has degrees over 86°F. The other thing about heat to think about is how quickly in the season does your heat come on. If you have really cold winters and hot summers, you might have a very short spring. If that’s the case you might need to save your cooler weather crops, like peas, cabbage, and broccoli, for the fall garden instead of planting them in the spring and hoping they produce before the heat sets in. You’ll also want to carefully select plant varieties. Maybe determinant tomatoes would be better than indeterminate tomatoes, or an early producing cucumber instead of one that is later producing? What is the length of time between your average last frost date and when you normally experience temperatures in the upper 80s or low 90s? Regardless of how many heat days you get, you always want to make sure that you take measures to avoid heat stroke while working outside. During the summer I try to be in the garden by 7am and back inside by 9am. We have a lot of humidity and so even if it’s only 85°F by 9am, the heat index can easily be 10 or more degrees higher. If I have to go out into the garden during the day “just real quick”, I toss on a long sleeve shirt and hat. It never fails, that when I don’t, I get side tracked and stay out long enough to get a tan. I don’t burn but I worry about long term sun exposure. See Heat Stroke – Symptoms, Treatment and Prevention for more tips on avoiding heat stroke and recognizing symptoms. It’s not only people who struggle in high temperatures. 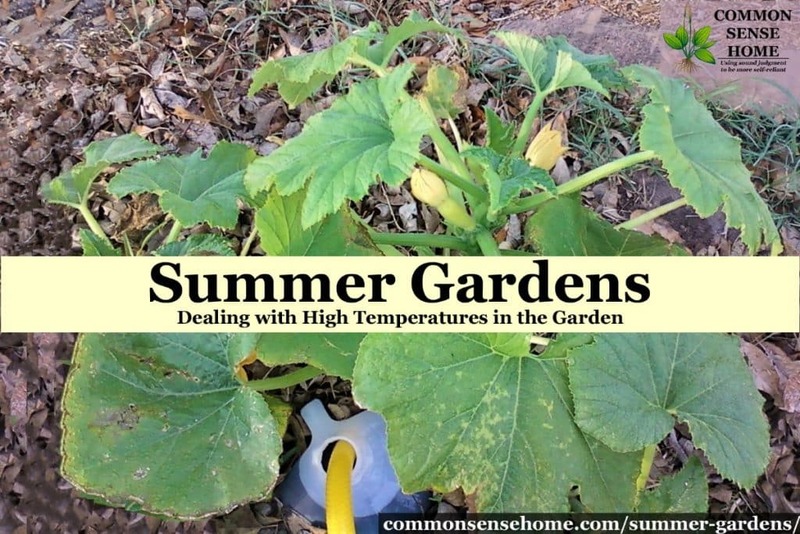 Once temperatures reach about 95°F, plants will struggle, even heat loving plants. Most will stop flowering and setting fruit. The goal at this point, is to keep the plants alive until the temperatures go down. Depending on how long your hot season is will determine how many plants you choose to keep alive. If you know you only have a few weeks of temperatures in the 90s or 100s, then you might choose to intensely care for your whole garden. However, if you have 8-10 weeks of temperatures in the 90s and 100s, like I do here in Texas, then you might need to limit the number of plants you can keep alive until the heat subsides. Because I live in a cold hardy zone 9, I can usually plant a fall crop of things like snap beans, cherry tomatoes, and summer squash. Therefore, I choose to keep only a few of our snap beans and a few tomato plants alive through the heat. Our okra, peppers, and basil do just fine in the heat with minimal care, so I tend to those too. What you choose will likely be different because your climate and season of life is probably different than mine. I have neighbors that are able to keep their entire vegetable garden alive all summer. However, their garden is smaller than mine and they no longer have children in the home. There’s no right or wrong answer, every gardener needs to make the choices that are best for them. The most important thing you can do for plants in the heat of summer is to water them. Water will cool the plants off and keep them hydrated. I know we all want to see perky leaves on our plants, but try to water the ground and not the leaves. Summer is prime time for powdery mildew and other diseases that flourish in hot, damp conditions. Most people recommend watering only in the evening to conserve water. This gives the plants time to recover overnight before the heat comes again the next day. However, if you have temperatures over 100°F you might need to water more than once a day. Whenever you water, water deeply; this will cause the roots to continue growing down instead of spreading just under the surface. The photo above demonstrates a simple homemade irrigation option. Simply sink a container with a few small holes in the bottom into the soil near your plant. Fill as needed to maintain drip irrigation to the roots of the plant. Mulching your garden will help keep the moisture from evaporating, and is essential in the heat of summer. 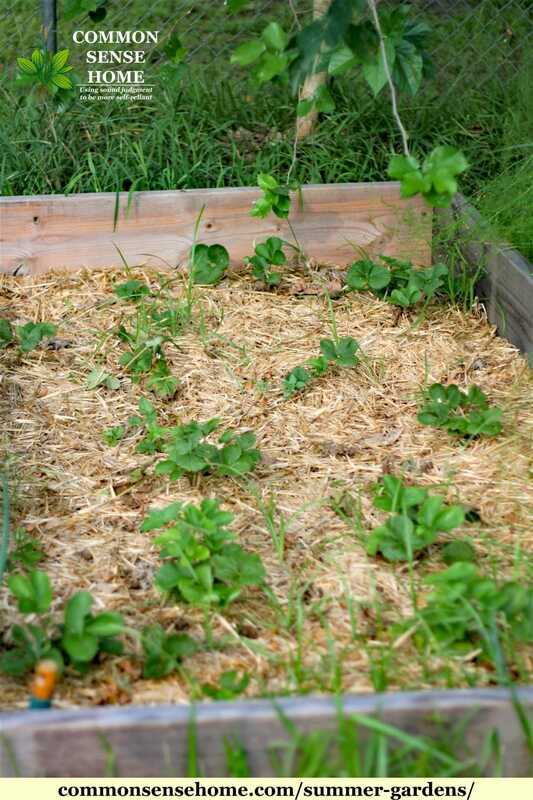 You don’t have to go out and buy mulch; leaves, straw, wood chips, and shredded newspaper all make good mulches. Before adding mulch, be sure to water the ground really well. When you need to water after you’ve mulched, try to put the hose into the mulch so you’re watering below the mulch and not on top of it, if possible. These strawberries are mulched and have light shade to protect them from summer heat. 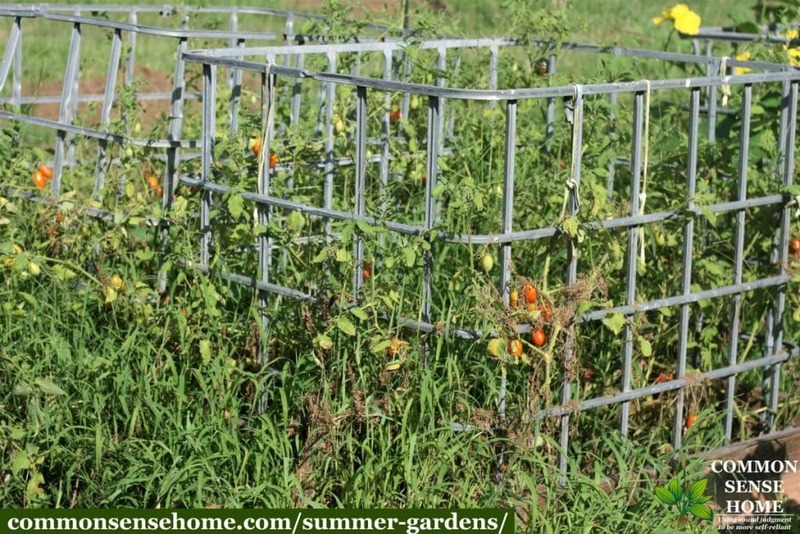 How much sun is too much sun in the summer vegetable garden? I know many plant tags or seed packets indicate that a plant needs full sun, but most plants don’t need 8 hours of intense summer sun day after day. So, if you have long hot summers, you can protect your plants by giving them some shade. One way to do this is to plant your plants that you want to survive all summer in dappled shade or where they get afternoon shade. If you have already planted and your plants are really struggling, you can purchase shade cloth for them. I’ve not used this but every year I say I’m going to try it. The shade cloth will protect the plants from the intense heat but you will still have to water and mulch the plants. These tomatoes are struggling in the summer heat. This has really helped me enjoy my garden more, even in the dead of summer. 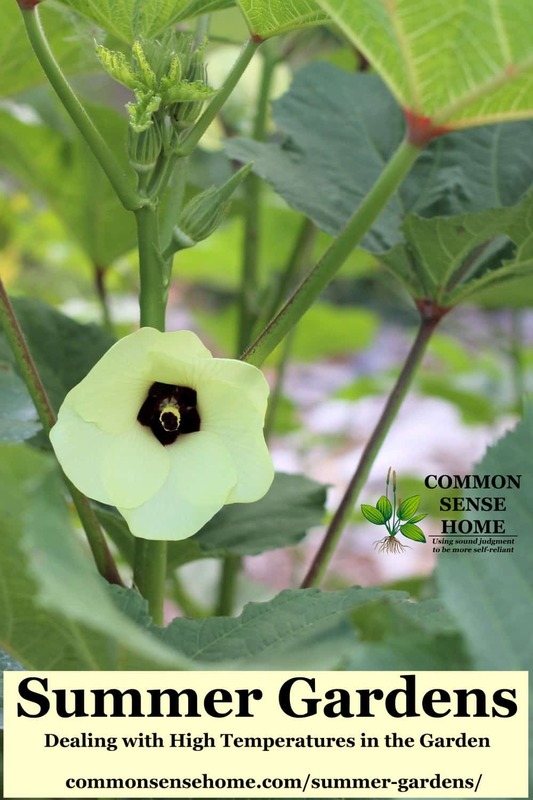 Summer gardening certainly has its challenges, but by watering, mulching, and providing shade your summer gardens will have a good chance of keeping your vegetable garden alive all summer long. 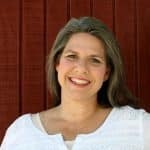 This is a guest post by Angi Schneider. Angi Schneider lives with her family along the Texas Gulf Coast on 1.5 acres, where she keeps a large garden, a growing orchard, chickens, and bees. When she’s not in her garden or homeschooling (or chauffeuring) her children, she can be found hanging out and chatting about all things simple living at Rootsy.org. On her personal website, SchneiderPeeps, she offers a great product called The Gardening Notebook. The Gardening Notebook is custom printable e-book to help you keep track of everything that is important to you in your gardening.